Originally written in 1964 as The Tale Of Aladdin. 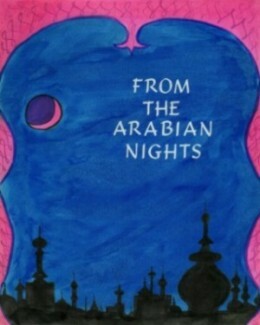 Re-written in 1972 as From The Arabian Nights. Re-written in 2002 as The Tale Of Ala-ad-din. Taking the tale from 1001 Arabian Nights as a basis, the play is set, not in China as is the original, but in a fantasised and idiosyncratic Baghdad and uses the story to become a comic attack on human hypocrisy, selfishness and the loss of innocence. The subplot involving Pietro and Violante references its source taken from Boccaccio by retaining their character names and giving Pietro cod Italian dialogue during the discovery scene with his father from the mythical country of Artilia. Although based on people he knew or had encountered, all the characters are stylistically influenced by Armstrong's great comedy mentor at the time, Ben Jonson, and sometimes even extend to a cartoon level of comic exaggeration. Armstrong also envisaged specific actors in certain roles. For the original 1964 draft: it was Thora Hird for Yashmin; Diana Rigg for Princess Badr-al-budur after Armstrong had seen her play Helena in Peter Hall's production of A Midsummer Night's Dream for the Royal Shakespeare Company. For later re-writes, as the Princess increased in age, camp and promiscuity, the source of inspiration became Anna Quayle for whom he would, later, write screen roles. 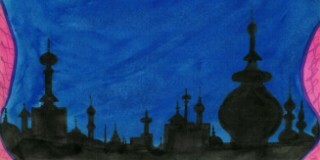 The Grand Vizier was partially inspired by Cherkassov's Ivan in Eisenstein's Ivan The Terrible and memories of Hans Conried's wicked Vizier in the 1959 UPA Mr Magoo cartoon version of the Aladdin story, 1001 Arabian Nights. In the later rewrites he envisaged Leonard Rossiter in the role. In 1972, Armstrong was involved in an intended summer drama season, Play Time ‘72 at the Roundhouse in London. A 24 strong company of rising young talent were to appear in 5 productions running in repertory. Armstrong planned to write a new comedy, Prometheus, for Joe McGrath to direct for the season and opted, as his own directorial contribution, to premiere The Tale Of Aladdin. As he embarked on editing and rewriting certain scenes, he gave many characters their original Arabian Nights names - most notably, the character of Aladdin, himself, becoming Ala-ad-din. He also re-titled the play, From The Arabian Nights, to avoid audiences thinking they were going to see a family pantomime. 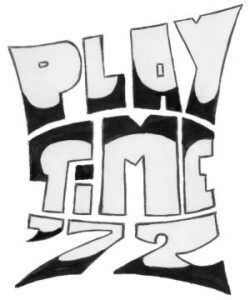 Despite arousing tremendous interest in Play Time '72, the producers failed to raise sufficient backing in the time required and were, finally, forced to abandon the project. Prometheus remained half-completed and From The Arabian Nights was returned to its shelf. In 1983, Armstrong revived his interest in the play and, to assess its viability, organised a performed reading with producer Robert Macintosh, for friends and industry figures. The reading, in which Armstrong, himself, played several roles, convinced him that the play could work successfully with an audience but still needed further editing and revision. Work commitments and his departure for America in 1984 meant that the play was once more returned to its shelf without any work being done. In 2002, Armstrong finally dusted the play down and started serious work on editing and revising it in readiness for a tryout. He also returned it to the original 1964 title but with the earlier modification he had made to his leading protagonist's name, finally calling it, The Tale Of Ala-ad-din.